Under the California Code of Regulations, Title 8, Section 6151 the fire extinguisher services are spelled out. Fire extinguishers must be serviced by a professional company annually and every six years, they must be recharged. 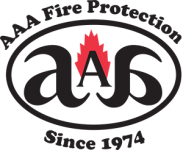 At AAA Fire Protection Services we've seen firsthand the result of fire extinguishers that do not work. This is why we work with businesses of all sizes in Redwood City and throughout Silicon Valley. We bring 40 plus years of service to every client with whom we work. We offer affordable services that keep your fire extinguishers serviceable and ready in case you should need them. We provide annual testing and tag each unit so that your business meets the California Code of Regulations. We also recognize the value of fire extinguisher sales and our sales team helps companies just like yours put the right fire extinguisher in the right place. There are many different types and sizes of fire extinguishers available. It is important that you have the right type of fire extinguisher. A good example of this would be to have a kitchen rated fire extinguisher stationed in a commercial kitchen. We are happy to help your company become compliant and remain compliant. If you'd like to schedule services or have questions that we can answer, please give us a call at (800) 543-5556.